Now on demo the Hegel H-160 is one stereo amp which is affordable but can compete with much higher end components in the market. Hegel makes it easy to connect to any home theater system using it’s theater bypass mode. 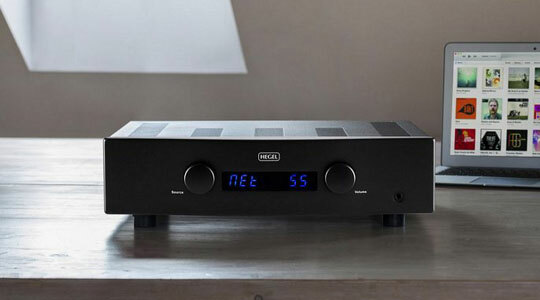 The Hegel H-160 has some of the broadest connections on the market which features analogue inputs, Airplay, USB, digital coax and optical. One of the newest features is the ability stream via DLNA or Airplay. The Airplay feature is like no other where it bypasses the normal digital volume controls on your phone/tablet and uses it’s own preamp to control the volume. This new advance airplay allows you to stream music from your phone and other services such as Tidal with high quality transfer. Just like other Hegel amplifiers it features it’s patent sound engine technology. This amplifier design completely turns ordinary amplifiers designs upside down. This results it greater dampening factor for control is bass and a much more pure and smoother sound. If our little audio world wasn’t quite so set in its ways, the Hegel H160 should be a Shot Heard Round the World, like the Devialet.